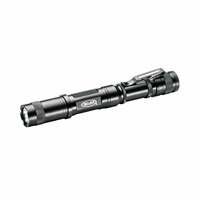 The Sleuth is one badass flashlight combining ultra-powerful bright light with a subtle strike bezel for peace of mind. Seamlessly cycle through 160 lumen high, low, and flash modes with Police Securitys Soft Switch technology. Attach the lightweight, architectural-grade aluminum flashlight to your belt, purse, or keychain with an industrial-grade clip, its not going anywhere.